When I asked about writing a post for the SMFS blog, Gerald So suggested a discussion of character development in short stories versus novels. Are series characters different in the two forms? Is anything missing? That’s a lot for a short post, but a short post is long enough to make a point. My first reaction was yes, of course, lots of things are missing, echoing a general opinion I’d heard for years, since I first started reading crime fiction. People love Agatha Christie’s novels, but not her short stories as much. The late critic Robin Winks believed crime fiction needed a full-length novel to reach its potential. The short story didn't offer enough room for both character and plot, and was overall an unsatisfying medium for crime fiction. I was ready to write something along these lines when I thought about my own experience. I tried writing a female amateur sleuth living in India almost twenty years ago—and got nowhere. I think I wrote four novels featuring various versions of Anita Ray. The novels were terrible. I got advice from an agent, and other readers, but I could not find the character who would make the story come alive. Nothing worked. I continued writing the Mellingham series with Chief Joe Silva and the occasional story along with reviews and articles while I stumbled along wasting paper and time on India stories that went nowhere. I was about to give up in frustration when I decided I'd write a short story with Anita Ray and focus on a murder that grew out of Indian culture. Anita's role was to investigate, nothing more. Out of that restriction came the surprise of Anita’s personality. I'll give as an example Robert Lopresti's story featuring the barely-making-it writer Leopold Longshanks in "Shanks Goes Hollywood" (AHMM, April 2005). In the first page we know who he is, how he feels about his career and that of his friends, and how smart his wife, Cora, is. It’s a good mystery and it’s fun, and we know the characters well. Every detail of the plot works, and there are no loose ends. I could cite other stories that remain more vivid than novels, such as "Goodbye, Pops” by Joe Gores (The Best American Mystery Stories of the Century, ed. Tony Hillerman), in which a man escapes from prison in order to see his father before he dies. The obvious examples are Sherlock Holmes stories or any story by Edgar Allan Poe. 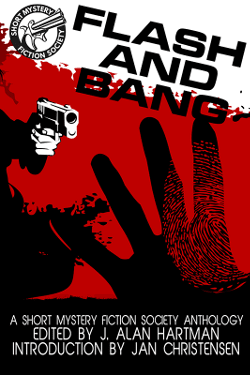 So, is there a difference that matters between short crime fiction and the crime novel? In a novel we get to spend more time with the characters, the plot may be more convoluted, but it's easier to mask failings in a novel than in a short story. In short crime fiction the character has to arrive fully developed, clear and sharp, in a plot that works. There can be no loose ends, no details that don't quite work, and no bait-and-switch in the plot. This is not easy.